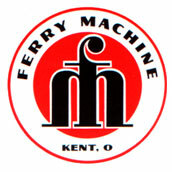 Ferry Machine Company was founded in 1927 by Ernest Ferry in the Harris building in downtown Kent, Ohio, as a small machine shop for specialty engineered parts. Ernest’s brother Jim joined the company in 1928 as a partner. The firm was moved to Summit Street in Kent in 1928, and then to West Main Street in 1937 where the company remained until 1993. 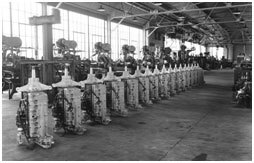 During the war years, 1942-1946, Ferry Machine Company continued its machine shop activities but also began to make assemblies of components, including parts for the military aircraft through its association with Goodyear Aircraft. 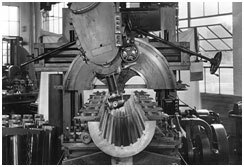 Later the company forged strong relationships with the Timken Company for whom it produced custom machines designed by Timken in cooperation with Ferry design personnel. 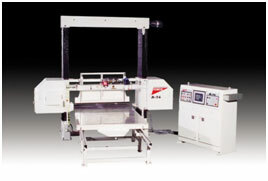 Ferry also took licenses from BF Goodrich Company to produce BFG’s line of rubber testing machines—Flexometer, Pico Abrasion Tester, and Wills Trimmers. These specialized machines have been sold globally to tire producers to assure quality output of tires and other rubber products. The company also produced some novelty products from time to time; for instance, Ferry manufactured a specialty post-hole digger for installing guardrail posts on the initial Pennsylvania turnpike system. Ernest Ferry operated the company until 1970 at which time he turned the day-to-day operations over to Ed Phillips who had been a foreman in the plant. In the fall of 1980, Ferry purchased the assets from McNeil Akron for the FEMCO line of band-saws for cutting flexible foam, rigid foam, and structural honeycomb. 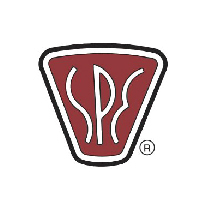 This acquisition marked the first time that the company had its own proprietary product line. Today, the FEMCO line continues to be an important part of Ferry’s output. 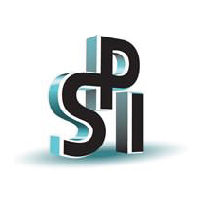 The company provides modern high speed-high tolerance bandsaws to major honeycomb producers and balsa producers that are used for aircraft and marine structures. The Femco line of flexible foam bandsaws is recognized as a mainstay in the flexible foam industry where the machines produce foam for bedding, packaging, seating, fashion, and other industrial applications. The year 1982 marked a major change in the course of history for Ferry Machine Company—Harry Covington and a group of investors bought Ferry and changed the name of the company to Ferry Industries, Inc. The name change was made to reflect the new direction that the company wanted---away from a job shop to a proprietary product base. 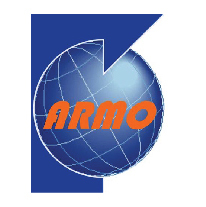 Immediately, Ferry Industries, Inc., entered into a license agreement with Orme Polymer Engineering, Ltd., of Higham Ferrers, England, to produce the Orme range of plastics rotational molding machines. Orme had been a small but innovative producer of these machines for the European market but had no presence in North America. Ferry built its first rotational molding machine in 1983 and since that initial machine the company has produced more than 1,000 rotational molding machines. Ferry made a significant technical breakthrough soon after it initialized its license agreement. Previously all rotational molding machines in North America had used a traditional technology called the fixed-arm turret machines, while the new Orme technology incorporated an independent-arm concept; however, the Orme technology limited the flexibility of the system. 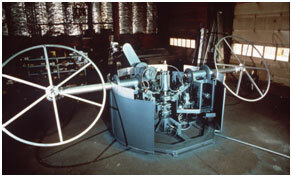 Ferry soon developed the 4-arm, 5-station machine in 1984, a design innovation that changed the way the industry produced rotationally-molded products. The development allowed for higher productivity from machines; but, the 4-arm, 5-station machine allowed the customers to use larger molds of higher weight than before, thus enabling the market to seek business that previously was not available to them. 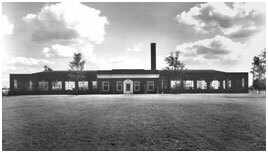 When Covington and associates purchased the company in the fall of 1982, Ferry was geared to small shipment levels—and by the early 1990s the company’s growth rate was such that the old facility on West Main Street in Kent was deemed too small and Ferry Industries moved to Stow, Ohio, to a significantly larger facility. The company has since moved again--this time in 2000 to an even larger facility in Stow where it remains today. The company had its eye on growth in the European market so Ferry bought the assets of Orme Polymer Engineering, Ltd., in April 1993. 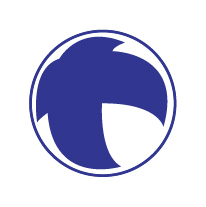 The new Ferry subsidiary company was named Rotospeed Ltd., headquartered in Wellingborough, England. 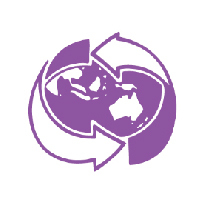 The company began manufacturing for the European and mid-East markets immediately upon opening the new company. 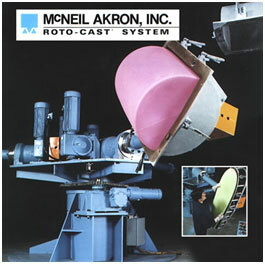 Mid-1994 saw the acquisition of McNeil Akron’s Roto-Cast line of rotational molding machines by Ferry. With Ferry having strong market positions in the aerospace and plastics molding industries, the company made a decision to enter the field of CNC routers for plastics and non-ferrous metals. 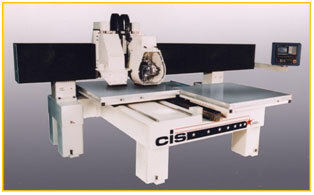 It found a companion in Canton Industrial Systems (CIS), a small, but technically capable, producer of CNC routers. Ferry acquired CIS in 1998, changed the company name to Quintax and began to produce 3-axis and 5-axis CNC routers for the plastics, mold making and pattern making industries. Quintax routers can be found in many notable aerospace companies and are used by many rotational molders and thermoformers as well as foundry pattern makers. Today, Ferry is a world-class producer of its line of RotoSpeed rotational molding machines in carousel style, in-line shuttle machines, giant shuttle machines, and rocking oven machines. The product line lists 40 different models. Ferry has sold more than 1,000 machines in 58 countries globally and is instantly recognized as an innovative producer of quality machines. 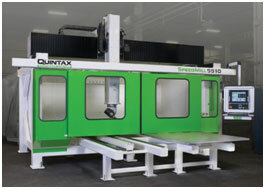 Quintax CNC machining centers have evolved into a superior product since the acquisition of the CIS assets, becoming a leading product of Ferry. A new and innovative range of products provides faster operating speeds, increased productivity, higher accuracy and safer working environment to the users. The Femco bandsaws are a household name in the flexible foam business and have been for more than 50 years, and in recent years the increasing global air-frame business has become a strong area of focus area for the company and its high-tech honeycomb and balsa machines. Ferry has a reputation for working with customers interested in producing the best possible products. We’re committed to introducing new designs, product refinements, and effective integration of ancillary equipment to advance the technology and value of our products in the global market.